Thanksgiving is my favorite American holiday and I don’t think you need to guess why…it’s all about the FOOD! I love that I could fill my plate to the edges and still have to go back for seconds, or even thirds, to try everything on the table. Little hot dogs wrapped in puff pastry, stuffed mushrooms, duck, turkey, stuffing, sweet potato pie, green been casserole, cranberry sauce, and so many other tasty dishes! And let’s not forget dessert; all sorts of pies like pumpkin, pecan and apple and lots of cookies and pastries. Yum! Last year, I hosted Thanksgiving for around 30 people and had the time of my life cooking and baking for days on end. Since I won’t be hosting Thanksgiving dinner this year, I figured I could still make at least one dessert to bring as a gift to my host’s. How could I NOT cook on such a special holiday, right?!? These Coconut Cranberry Scones will make the perfect gift and the lemon curd, served right along side the scones, will surprise everyone with its sweet and tart flavor. I began with the lemon curd so it would have some time to cool. I mixed the sugar and corn starch in a saucepan then whisked in the juice and eggs. I brought the mixture to a boil and cooked for 1-2 minutes, until thick. I removed the mixture from the stove and whisked in the margarine and zest. I transferred the curd to a bowl, wrapped in plastic wrap and chilled in the refrigerator. Next came the scones! I mixed together the dry ingredients, then cut in the margarine (using my fun new pastry blender) until it resembled a coarse meal. 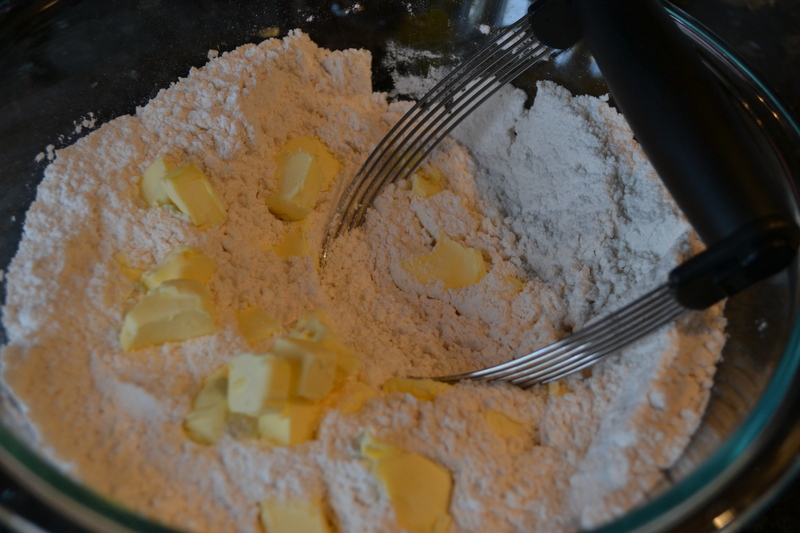 You can use a fork to cut in the margarine if you don’t have a pastry blender. Until just a day ago, that’s exactly what I was doing. In a small bowl, I tossed the whole cranberries with 2 Tablespoons of sugar and the zest. 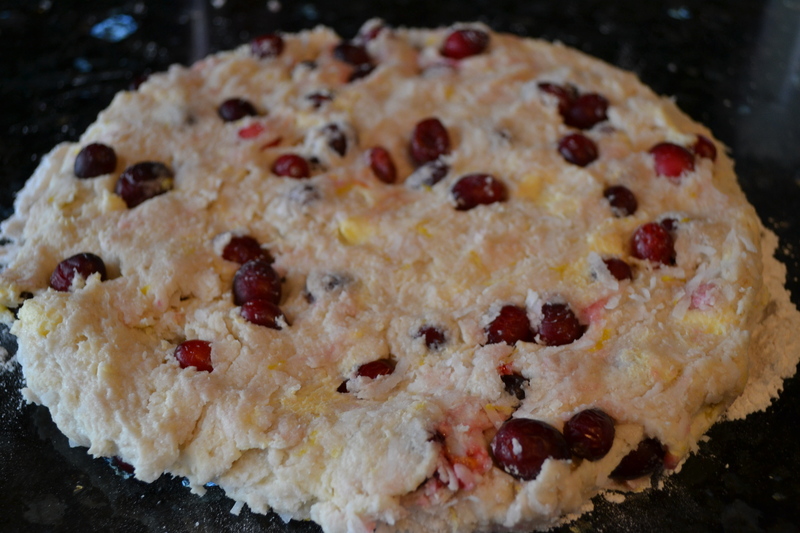 I added the sugar-coated cranberries and coconut to the flour mixture. I made a well in the dry mixture and poured in the coconut milk. I used a fork to pull the dry ingredients inward in to the milk until just combined. Be careful not to over-mix. I turned the dough on to a lightly floured surface and formed in to a flat circle, around 8 inches round. Using a 2-inch round glass dipped in flour, I cut out as many rounds as possible. I then re-rolled the scraps to cut out more rounds. I was able to cut 14 scones and I placed them 1 inch apart on a baking sheet lined with parchment paper. I baked the scones at 400 degrees for 20-25 minutes, until pale golden. I served myself one delicious warm scone with a heaping spoonful of the cooled lemon curd. 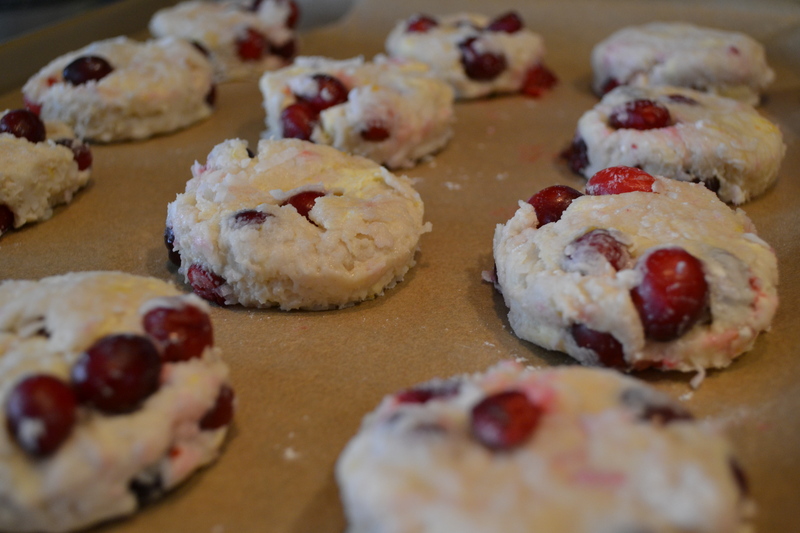 The whole cranberries gave the scones a rustic feel while the coconut added chewy texture and unique flavor. And you just can’t go wrong with the tart creaminess of homemade curd. The rest of the scones are in the freezer, ready for Thanksgiving dinner. They are individually wrapped in plastic wrap and will last 1 week in the freezer. I love things I can make ahead of time! 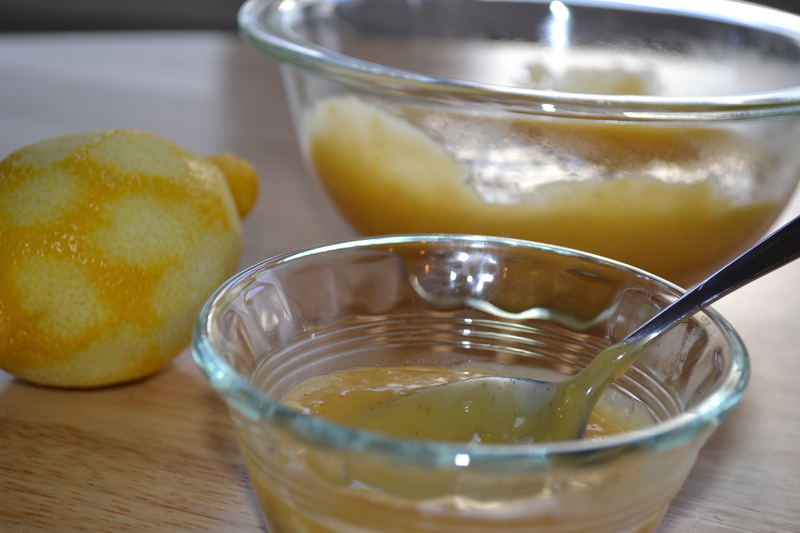 Begin with the lemon curd so it has some time to cool. Mix the sugar and corn starch in a saucepan then whisk in the juice and eggs. Bring the mixture to a boil and cook for 1-2 minutes, until thick. 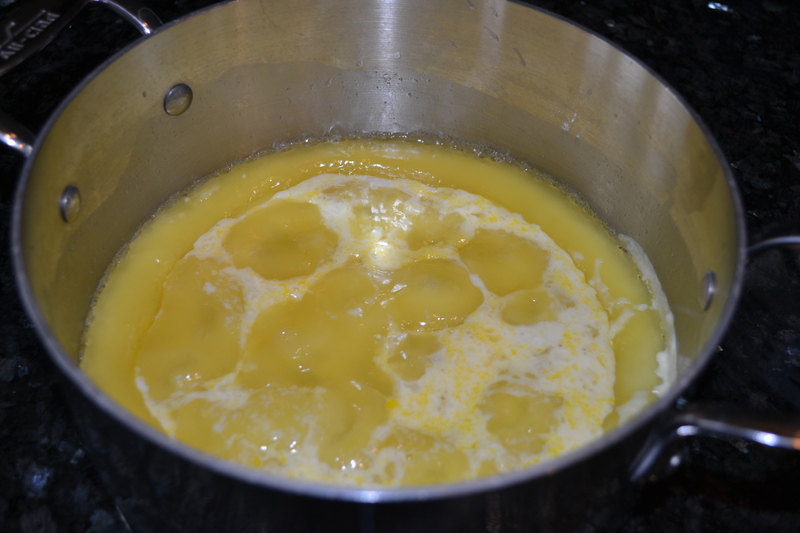 Remove the mixture from the stove and whisk in the margarine and zest. Transfer the curd to a bowl, wrap in plastic wrap and chill in the refrigerator. Mix together the dry ingredients, then cut in the margarine using a fork or pastry blender until it resembles a coarse meal. In a small bowl, toss the whole cranberries with 2 tablespoons of sugar and the zest. 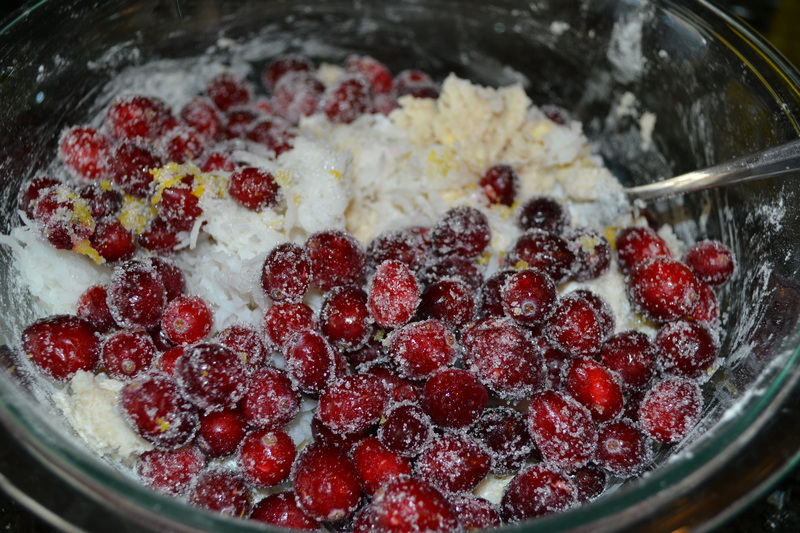 Add the sugar-coated cranberries and coconut to the flour mixture. make a well in the dry mixture and pour in the coconut milk. Use a fork to pull the dry ingredients inward in to the milk until just combined. Be careful not to over-mix. Turn the dough on to a lightly floured surface and form in to a flat circle, around 8 inches round. Using a 2-inch round glass dipped in flour, cut out as many rounds as possible. Re-rolled the scraps to cut out more rounds. Place them 1 inch apart on a baking sheet lined with parchment paper. Bake the scones at 400 degrees for 20-25 minutes, until pale golden. Serve the warm scones with a heaping spoonful of the cooled lemon curd. 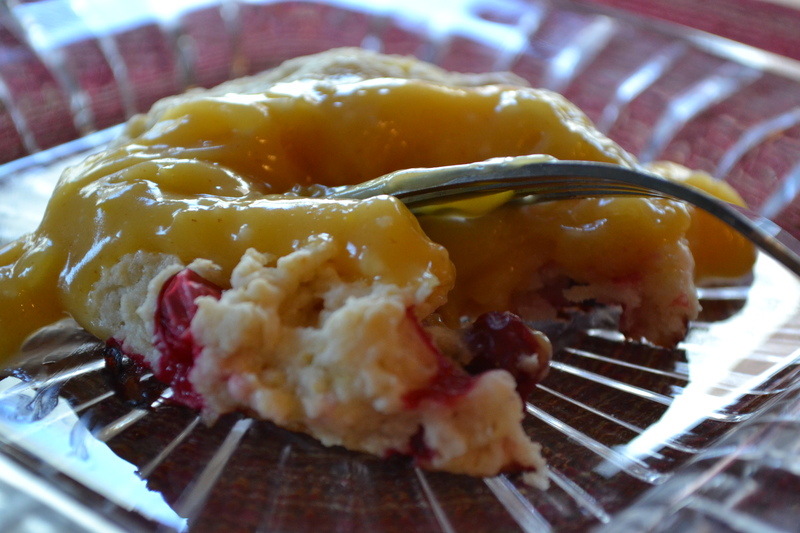 3 Comments on "Coconut Cranberry Scones with Lemon Curd"
I love lemon curd, this looks delicious. I don't have much of a sweet-tooth so lemon and citrus baked goods really appeal to me. I love lemon cake and lemon muffins but have never thought of adding cranberry. Thanks for sharing!